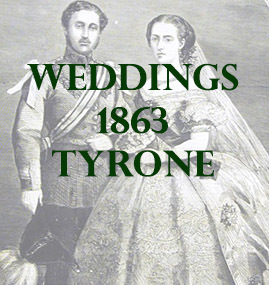 The following list contains marriages that mention places in county Tyrone. At Dungannon Wm Doran Esq., merchant, Dungannon, to Jeanie daughter of John Lowrt Esq., Lime Works, Dungannon. At Fecarry House, county Tyrone, Burlaigh Stuart, Esq., Major Royal Tyrone Fusiliers, so of the Hon A.G. Stuart, D.L. to Susan Mary, daughter of the late Henry Briscoe Esq H.E.I.C.S. In the R.C. Cathedral Dublin Daniel C. Lahiff Esq., son of Henry Lahiff Esq., Cloonmore House, County Galway to Mary daughter of Christopher St. George Esq., J.P., Tyrone House in the same county.